Always bear in mind these 11 benefits pineapple brings you. 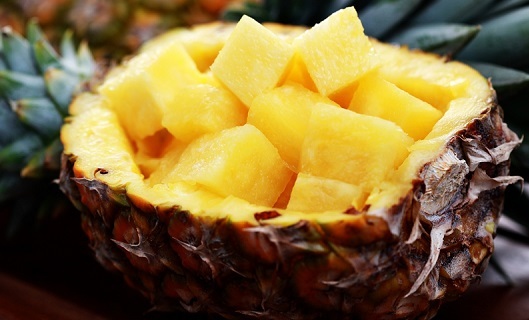 Eating pineapples and enjoy a wide variety of healthy nutrients, minerals, vitamin C, etc. When it comes to tropical fruits, there is none which can rival pineapples. Aslo known as Ananas comosus, pineapples are a great source of essential healthy nutrients and vitamin C in addition to copper, folate, manganese and the all-important plant compound, bromelain. Apart from their obvious nutritious value, they are no doubt a delicious treat which can be enjoyed in various different forms. For example, you can make pineapple juice, can it, dry it or mix it with other ingredients to make scrumptious delicacies. The percentage is calculated on a 2,000 calorie diet. As you can see, pineapples are full of beneficial nutrients, and can work to improve your body health. Below are some terrific ones that can persuade you to add this fruit to your diet. Benefits of Pineapple You Should Not Miss! Pineapples are a great source of vitamin C. Indispensable against cardiovascular diseases and joint pain, vitamin C is primarily a water soluble antioxidant which serves as a shield against elements which harms your body cells according to researchers. Do you still think only milk can make your bones stronger? Think again. Eating one pineapple can account for almost 75 percent of your daily intake of mineral manganese, an essential element for making your bones stronger. These minerals aid your body in building stronger bones and connective tissues and additionally helping post-menopausal women avoid osteoporosis. 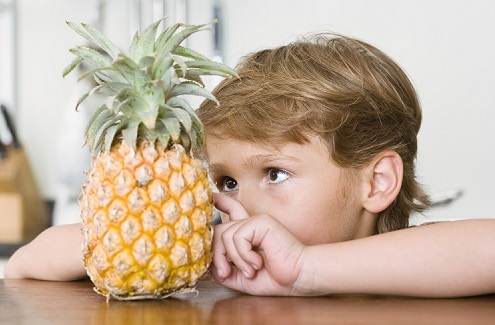 Vitamin C and antioxidant, which is abundant in pineapples, help in augmenting your vision clarity. In addition, pineapples can also delays the onset of aging related visual complications, for example, preventing the macular degeneration as you age. Dietary fibers found in pineapples help your body in maintaining healthy intestines which are essential for digestion so that your body is unable to store excess insoluble fats which results in weight gain. In addition, the presence of bromelain also helps in efficient metabolism by breaking down the food you eat according to studies. 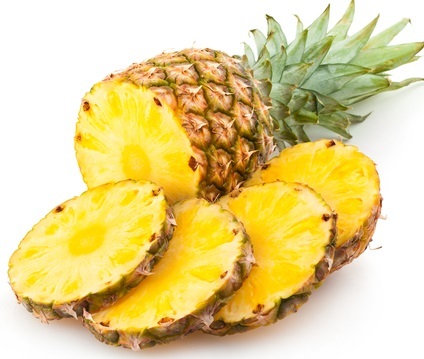 The presence of meagre amount of sodium and appropriate amount of potassium in pineapple minimizes hypertension by regulating blood pressure to an optimum level. People suffering from hypertension are advised to have pineapple juice on a regular basis to keep healthy and fit without the risk of high blood pressure. One of the lesser known benefits of pineapple is its ability to protect the teeth and gums primarily because of the inclusion of vitamin C. Primarily, eating pineapples strengthens the gum by limiting the formation of plaque, thereby restricting bacteria from hurting your teeth and gums. It also serves as a powerful deterrent against diseases such as periodontal and gingivitis which are very harmful to the very health of your mouth. Pineapples are also useful if you want to maintain a healthy heart. Pineapple juice is pivotal for the efficient flow of blood in the circulatory system. In addition, regular intake of pineapple juice reduces the chances of cardiac unrest by making the blood thinner and reducing the risks of different cardiac diseases. The presence of vitamin C essentially serves as an antioxidant by fighting free radicals and curbing the dangers of atherosclerosis as pineapple is also anti-coagulant. The antioxidants in pineapple are crucial in preventing the formation of cancerous cells which are known as free radicals. Recent studies conducted by scientists have revealed that pineapples can reduce the side effects of cancer as they contain bromelain. This one factor might serve as one of the most important benefits of pineapple. The presence of antioxidants, minerals and vitamins in pineapples makes it an ideal diet for people who are looking to increase their fertility. Apart from its aphrodisiac tendencies, pineapples are also a great fruit to have for pregnant woman who are looking to curb nausea as it serves to fight morning sickness or motion sickness for people who feel nausea while flying, driving or travelling on water. Pineapple is well-known for serving as the ultimate skincare product as it gives you glowing skin due to the presence of bromelain when applied externally or even when consumed. Pineapples, due to the presence of vitamin C, serve to repair skin tissues and get rid of dead skin at a faster rate while also boosting the collagen levels in your body to reduce the overall redness and inflammation that you might be suffering with. Pineapples are great for the scalp and your hair in totality as the abundance of vitamin C acts as a major deterrent against free radicals. Just apply some pineapple juice with some milk and olive oil on your hair for 10 minutes and get shiny strong hair. Pineapple will also help to increase the longevity of your hair permanently, thanks to the high quality nutrients in this tropical fruit. Are There Any Concerns Associated with Eating Pineapples? Apart from the benefits of pineapples, are there any concerns you should notice? The answer is yes. As you might have already noticed, pineapple is abundant in vitamin C and bromelain which, if taken in excess quantity, might result in issues such as nausea, vomiting, abdominal pain or diarrhea. Besides, bromelain in particular might conflict with certain medications which you are already taking such as anti-depressants, blood thinners or sleeping pills, etc. In addition, consumption of too many pineapples might create tenderness of the mouth, lips, tongue or cheeks as this fruit is also used as a meat tenderizer. Furthermore, pregnant woman are strongly advised to have only a limited quantity of pineapple juice, because having too much or constantly having pineapple juice results in the contraction of uterus which at worst case scenario might result in a miscarriage and increased menstrual flow. Remember, diabetics should not consider having pineapple juice as it is abundant with high sugar and calories. If you accidently eat or drink pineapples which are not ripe yet, you run the risk of contracting severe diarrhea as unripe pineapples are toxic for human beings. Is Club Soda Harmful for Your Health?